The History of Aerobus International, Inc. The Aerobus' alternative to traditional modes of transportation had its origin during the early 1970's in Switzerland. Since then, Aerobus has undergone major patented engineering advances. This multi-million dollar modernization resulted in a sophisticated technology which exceeds its inventor's most optimistic dreams. Aerobus emerged from the genius of Gerhard Mueller, whose company designed and manufactured conventional aerial ropeway systems. His restless creative mind led to experimenting with a new cable suspended transport system which he called Aerobus. The initial successful testing of Mueller's Aerobus occurred in Zurich. So impressive was the environmentally safe demonstration that the Swiss government allowed the system to run through an ecological reserve. Subsequently, an installation was sold in Canada where Aerobus operated at a ski resort. 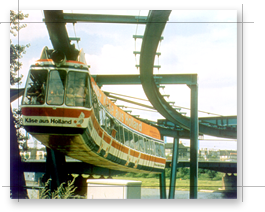 Later a two mile system was installed at the horticulture exposition in Mannheim, Germany, where 2.5 million passengers enjoyed a scenic Aerobus' ride through the city center and across the Neckar River. After six months of uninterrupted performance, as previously planned, the system was dismantled. The Mannheim experience provided valuable data to support Mueller's constant drive to perfect his new technology, utilizing a test track in Switzerland, he moved Aerobus into a higher stage of development and acceptance. His instincts and engineering improvements established a technology which became attractive to Vevey Engineering Works, Ltd., an internationally known manufacturer of railway cars and trams. Vevey acquired Aerobus from Mueller. Vevey's marketing activities exposed Aerobus technology worldwide. For example, construction of a system in Kuala Lumpur, Malaysia, was commenced but discontinued when final financing failed. Contemporaneously, a highly successful Houston businessman, became interested in the uniqueness of the Aerobus system. In 1987, and acquired Vevey's rights to Aerobus technology and patents, including the engineering studies, drawings and other materials supporting Aerobus development and marketing. It was not, however, until Aerobus received an invitation in 1992 to participate in a U.S. Government program involving suspended light rail transit, that it was decided to move Aerobus into a final stage of development. Based upon consultations with knowledgeable U.S. and European transit industry engineers, Aerobus committed the necessary financial resources to organize and sustain an exhaustive final design and engineering effort to bring Aerobus technology up to the highest standards of the international transit community. This determination and investment produced an Aerobus system with phenomenal capabilities. During this process, the fundamental distinguishing characteristics of Mueller's innovative technology were retained and improved. New patents were applied for, particularly on guideway features, and most importantly, Aerobus' cost-effectiveness, was assured. Two highly favorable reports on Aerobus deserve to be mentioned. The first was an assessment of Mueller's technology by the U.S. Department of Transportation's Urban Mass Transportation Administration ("UMTA") (later named Federal Transit Administration). 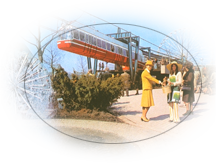 UMTA's report, based upon the successful use of Aerobus in Mannheim during 1975, assessed the innovative technology and how its characteristics related to improved forms of urban transportation. UMTA's conclusion was that Aerobus offered a viable solution to urban transit problems. In 1992, the Federal Transit Administration originated a $30 million competition to evaluate new transit technologies. A total of 17 local governments in various states participated by examining different concepts and submitting plans for an installation in their respective areas. Among others, Milwaukee County selected Aerobus as the favored suspended light rail technology. Milwaukee was then awarded part of a $1 million grant to develop a definitive transit program. The two-volume Aerobus-Milwaukee report was selected as one of three finalist proposals. 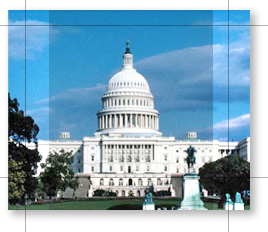 To date Congress has not yet funded the $30 million award. Of the final three, however, Aerobus is the only tested and proven technology. The other two remain in an untried, conceptual state. Aerobus development from Mueller's earliest concepts to the important advanced engineering period of the current ownership, has produced a transportation technology which meets the most demanding requirements of the 21st Century.